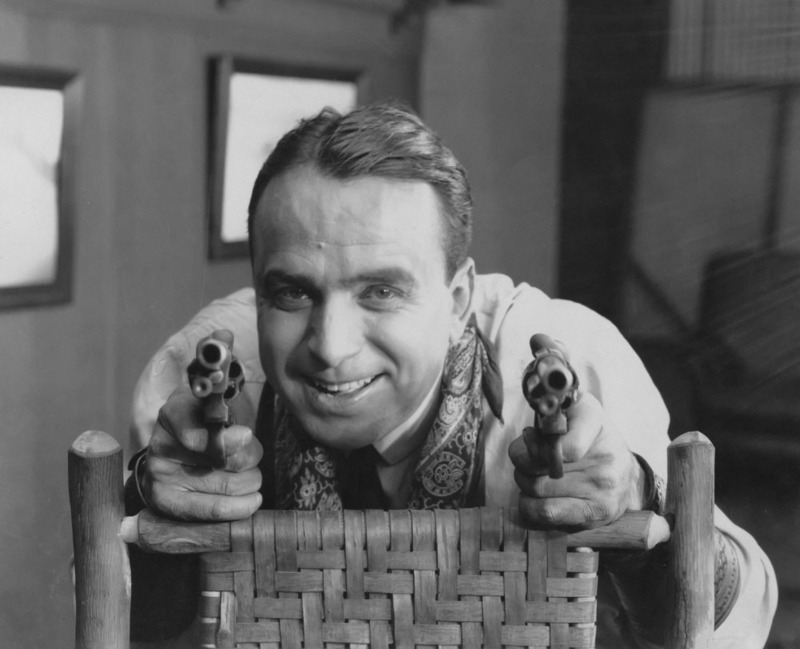 Douglas Fairbanks Sr. is rightly regarded as America’s first action hero. Before Clark Gable was dubbed “the King,” that title was bestowed on Fairbanks. He was Hollywood royalty. He and actress Mary Pickford were the film industry’s “power couple,” so successful that they formed United Artists film studio in 1919 with Charlie Chaplin and D.W. Griffith. To this quadrumvirate Griffith brought artistry, Chaplin humor, Pickford pluck and grace, and Fairbanks delivered power. On film, he was a living embodiment of pure energy, a relentlessly cheerful and resourceful protagonist who could not be defeated. His invigorating screen exploits gave viewers permission to dream big. Fairbanks’ greatest triumphs came in swashbucklers and costume dramas in the 1920s, but he started out in comedy, and Wild and Wooly, made two years before the birth of United Artists, is a sterling example of the brisk blend of romance, humor, and adventure that was to become a Fairbanks trademark. It was crafted by the team of Fairbanks, screenwriter Anita Loos, and director John Emerson, who made seven films that established the Fairbanks persona – a peppy, charming, optimistic go-getter; an enthusiastic super-child in a man’s body. Loos, one of the first real screenwriters, was key to Fairbanks’ early success. Her scripts have wit, drive. Their action is precise, fast-paced, to the point, not showy but as motivated as possible, subordinating itself to the telling of the story. Her movies move along leanly, stripped of affectation, boring exposition, and other distractions. Her intertitles are spare but pungent, used primarily for punchlines and witty observations. For the first time you get the sense that the person writing the story can see it from beginning to end, and can work back from the ending to tie everything together, to enrich the script. Fairbanks was a “personality” actor – rather than impersonate characters he played himself, with minor variations, throughout his career. And he was compelling – the perfect hero type, one that all the ladies want to dally with and all the men want to buy a beer. Though capable of extraordinary deeds, his persona was that of a regular guy, “Everybody’s Hero.” There is an essential blankness at the center of every leading man that allows the viewer to substitute themselves and sink into identification with the protagonist. Fairbanks was the male template of the time. During the period, there was a huge emphasis on “muscular Christianity” – a robust male ideal that combined the worship of physical health with that of chivalrous and knightly virtues. (Theodore Roosevelt was an ardent adherent.) In America, the East was identified with weakness, cities, addictions, and disease. The West, however, was rugged and natural, truthful and more “real.” It was a blank slate, a proving ground where a man could be reborn as his best idea of himself. In the Fairbanks-Loos-Emerson films, Doug, via various plot contrivances, is repeatedly faced with an extraordinary set of physical challenges to overcome. His character is defined through action and accomplishment, which moves him from being a hero in vitro to becoming the real thing. In this way, Fairbanks was a more serious version of Harold Lloyd, the wholesome, striving adventure comic who made The Freshman (1925) and Safety Last (1928). It’s illuminating to find out that comics legends Siegel and Schuster modeled Clark Kent on Harold Lloyd, and Superman on Fairbanks. Westerns in particular were good vehicles for this storyline. In Wild and Wooly, Doug is a banker’s son in the citified, sissified East who dreams constantly of the American frontier. He sleeps in a tepee, eats by a campfire (both located conveniently inside his father’s mansion), lassoes the butler, and carries on target practice. Hiss office is draped with works by Remington and Russell, Mexican blankets, rifle racks, and the like. He yearns for a vanished West or, more precisely, a mythic West that never existed. His gestures are too big for the board rooms in which he finds himself trapped. On Sundays, he gallops through Central Park, rolling his own cigarettes and sauntering into the movie house for a dose of Westerns. When his father’s bank is asked to invest in a railroad spur to the town of Bitter Creek, Arizona, Doug leaps at the chance to examine the prospects in person. Representatives from the town realize that Doug’s character wants a dose of the imaginary West. Doug doesn’t want to be a cowboy, he wants to play a dime-novel version of one. So, they decided to retrofit their modern community as an incarnation of Doug’s imagination – at least long enough to land the contract. It’s Westworld, 1917. The faux experiences they stage include a faked train robbery, followed by an Indian uprising, which gives the real villain, a grafting Indian agent, the idea to stage a real robbery in the confusion. At film’s climax, Doug is trapped by real Indians (broad stereotypes that chug redeye and plug townspeople), armed only with a gun full of blanks. That Doug promptly saves the day through miraculous striving goes without saying. His character’s vision is validated twice in the film – first, and falsely, his fantasy of the West; then, the fantasy brought to contingent life, rising from the beneath the surface of dull reality. Fairbanks was all about wish fulfillment. His character longs for adventure, then finds he is uniquely suited to its demands. For Fairbanks, either the world is not extraordinary at all, or else it is all the time, and he chooses to live the latter. If wrong must be righted, then it’s the hobbyist, the enthusiast, the dilettante, the dreamer, who is up to the task – that is, the viewer. Somehow, under the costumes and stunts of derring-do, Fairbanks was us. The NFR Project is one writer’s attempt to review all the films listed in the National Film Registry, in chronological order. Next time: The Blue Bird.